Last week, I had the good fortune of being invited to try out some traditional Sichuan foods at Fortune Well, along with Mr and Mrs Tomcat and baby Tomcat. Being a well established part of Sunnybank, I had long wanted to go but lacked the background knowledge on Sichuan food to give it the proper appraisal that it deserved. Luckily for us that night, Tomcat who is an expert in Northern Chinese cuisine was able to give us detailed narration (of food, amongst other things) whist we enjoyed our meal. Already running a little late for our appointment, I arrived to find we had been graciously given a private dining room, which allowed us the privacy of being able to appreciate the food with minimal interruption. 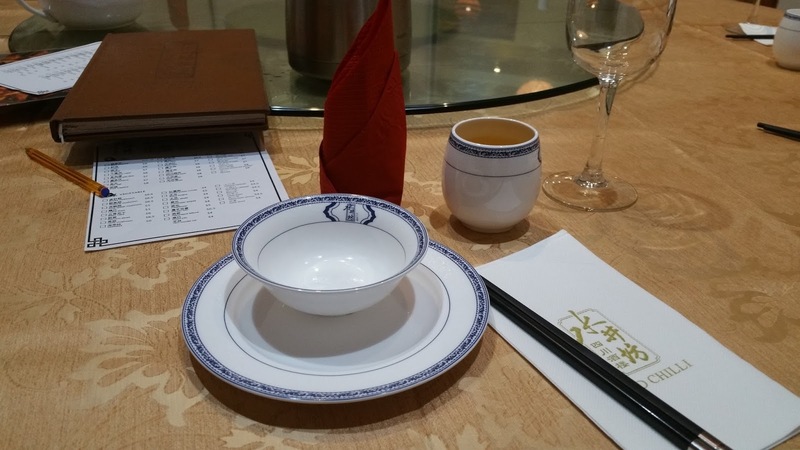 Our table of five was already set up and we were provided with a pot of fragrant tea. 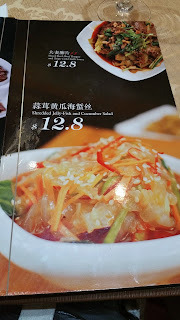 Browsing the very extensive menu, I was able to appreciate the essence of Sichuan food with its bold flavours from its frequent use of chilli, oil, garlic (yay!) and sesame. 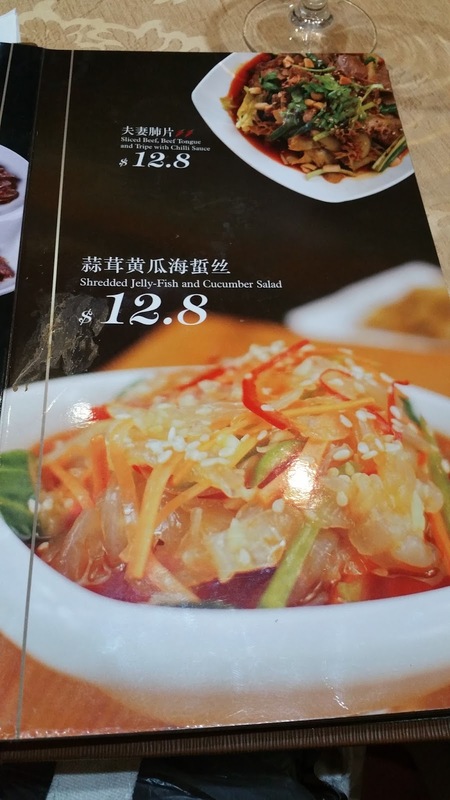 Not being overly familiar with the cuisine, I made several observations and then sat back to let the expert do the ordering. 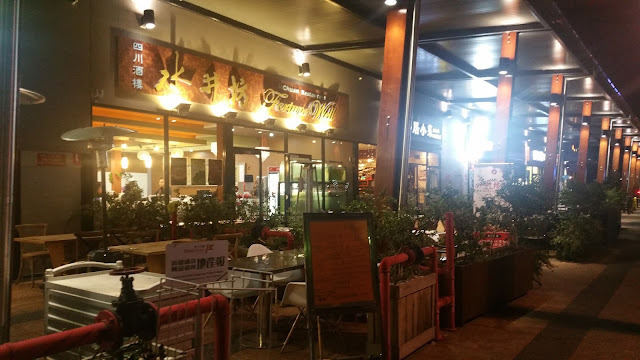 It needs to be noted as well that the manager was very friendly and helpful in assisting us in making decisions as to what to order, recommending what their specialities and signature dishes are, which gave me quite a bit of insight. Our meal started lightly, with my companion and Tomcat sharing a beer, whilst Mrs Tomcat and I were quite content to have tea. 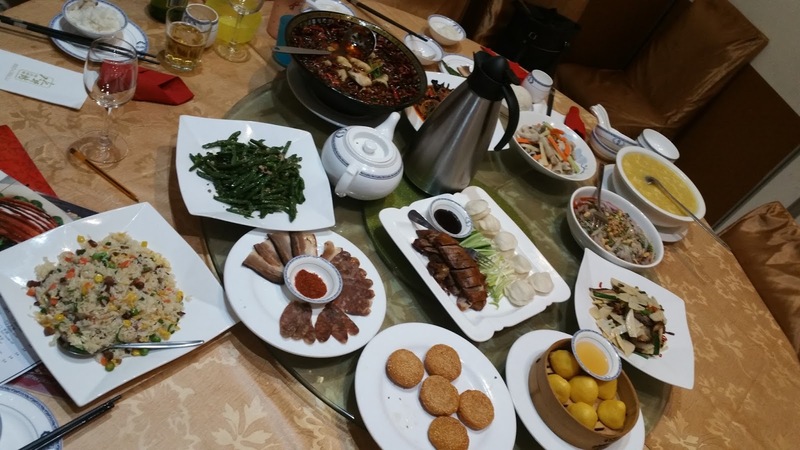 Soon after the drinking started, our food started to arrive, and within 10 minutes of the first dish arriving, our table was completely laden. It was a glorious sight to behold, and quite a challenge for four adults and one child to finish. The table was so full that we couldn't even fit all the dishes onto the turntable. We were super excited to be able to try it all. 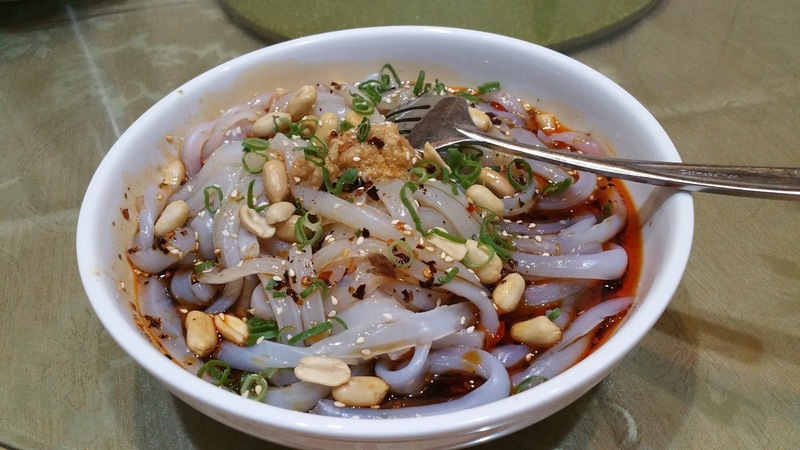 The first dish I tried was the Sichuan Green Bean Noodles with Sour and Spicy Sauce. Whilst not a particular fan of peanuts or sesame, the dish had my undivided attention due to the small pile of chopped garlic on top of the dish. Mixing the cold dish through, I was immediately immersed by the scent of chilli, garlic and sesame. The noodles themselves were quite refreshing and not too soft, with the sauces clinging onto it quite readily. It made for quite a good start to the meal. Another starter type plate we had was the Traditional Sichuan Preserved Platter, also served cold. 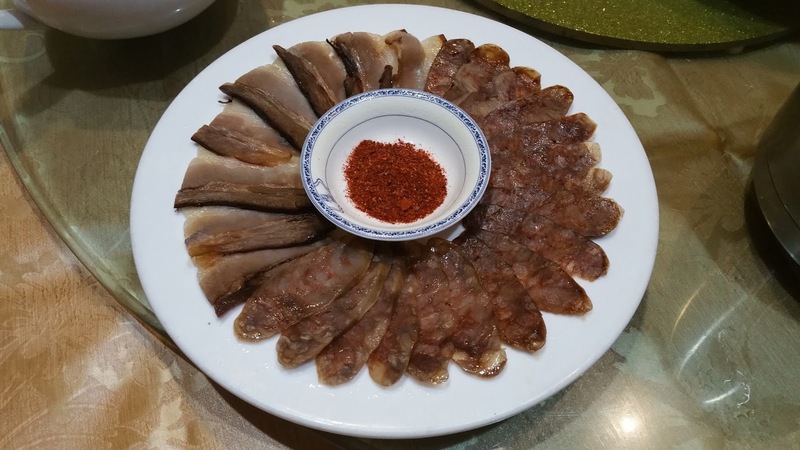 This consisted of preserved pork belly, and two types of preserved sausage, spicy and non spicy. I was advised that these meats were cured in house, and couldn't be bought anywhere else. 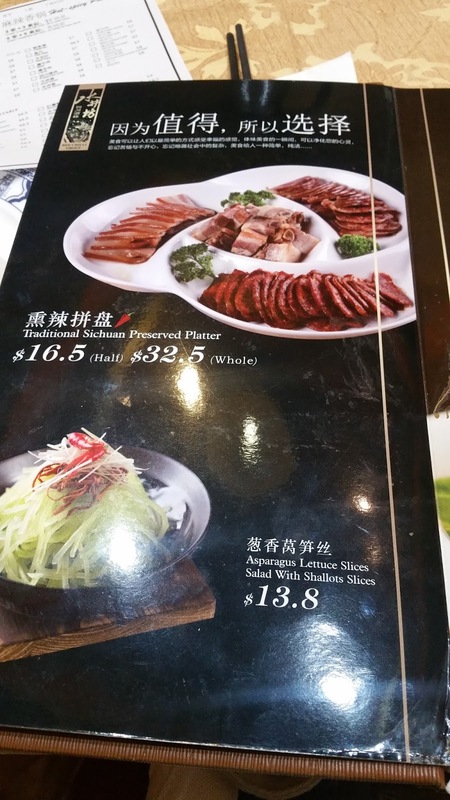 Looking at the dish drew immediate comparisons to the typical roast platter of Hong Kong style cuisine, but with obvious differences. The meats were really strongly flavoured, with a salty smoky flavour without being overbearing. 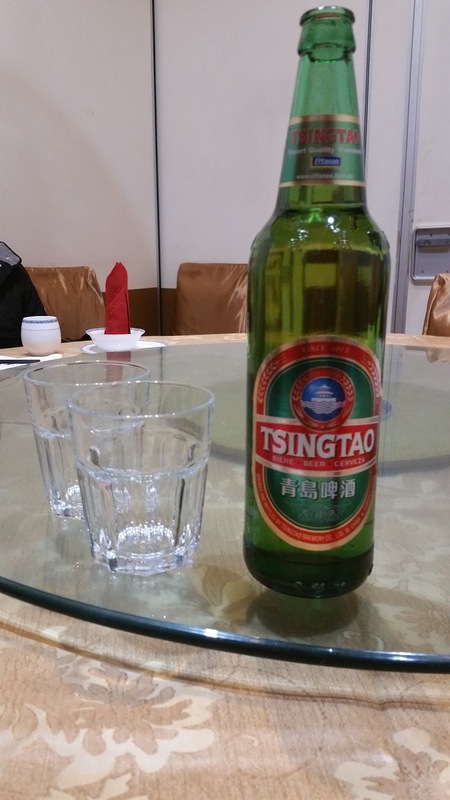 It goes well with rice in my opinion. 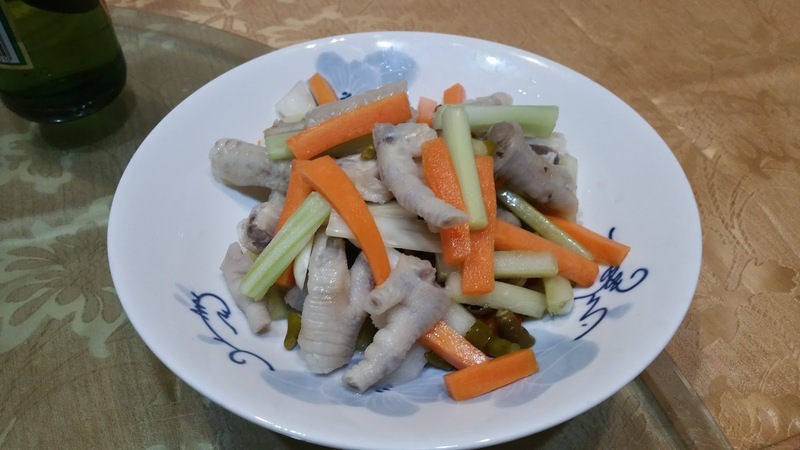 The final cold dish we had was the Pickled Chicken Feet with Pickled Vegetables. This was also cured in house, and the dish was refreshingly sour. Whilst not a fan of chicken feet myself, I could definitely appreciate the appeal it may have for others. The main highlight of the night, as well as my personal favourite was the Chef's Special Fish Fillets. 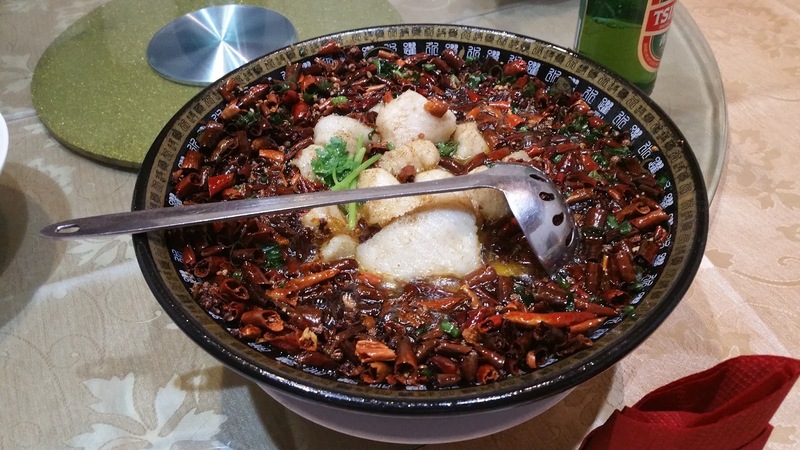 It is a signature Sichuan dish, comprising of fish fillets and bean sprouts simmered in a massive bowl of chilli and oil. Whilst it may look extremely spicy, the chilli was mostly there for taste and fragrance, and for those who are courageous enough to try, it was a very rewarding experience. 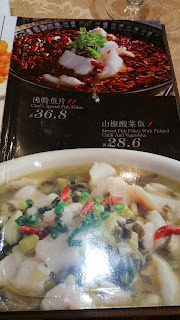 The fish fillets were very flakey and lightly fried on the outside, with a soft tender interior. I really enjoyed it. Mini Tomcat's favourite for the evening was the Crispy beef in sweet and sour sauce. Unlike the takeaway style bright red sweet and sour, this was legit and authentic. 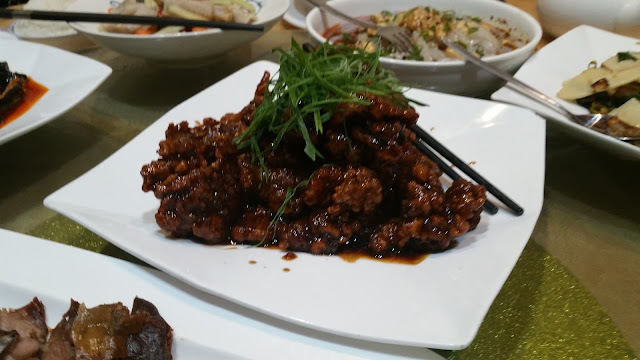 After being flash fried, the beef was basted in a sweet and sour coating, which lead to it sticking together quite a bit when we came to eating it. I really enjoyed the crispy exterior and the tender meaty interior. This was the Stir Fried Smoked Pork with Bamboo. 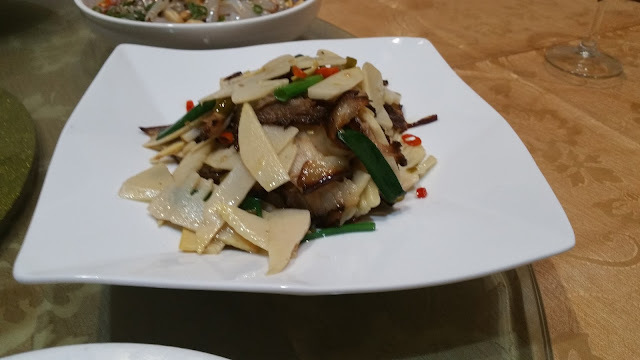 The smoked pork was the same pork belly that we had in our preserved platter, and I enjoyed the salty smoky flavour which rubbed off onto the crunchy bamboo shoots, making for a well balanced and healthy dish that was only very lightly spicy. This was the Stir Fried Shredded Pork with Chilli and Garlic. Again with garlic, I was hooked. I was told that this is one of the highlights of Sichuan cuisine, which should balance four tastes of salty, sweet, spicy and sour perfectly in each bite. 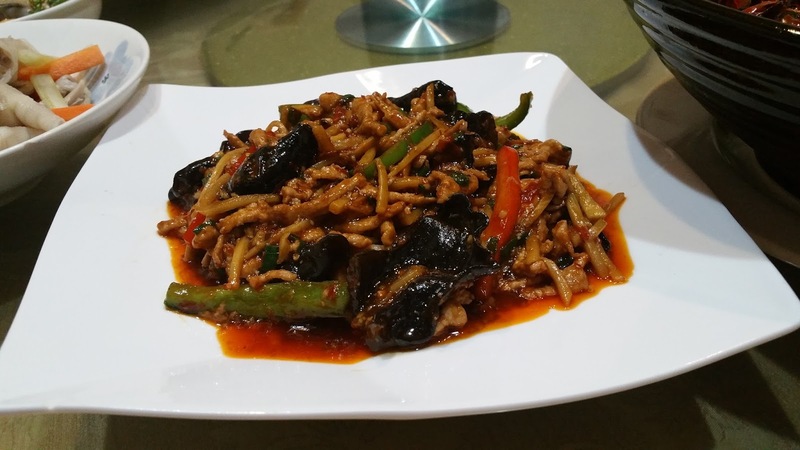 Unfortunately in today's version, the saltiness and spiciness was quite overpowering and we were not able to fully appreciate the sweet and sour aspects of the dish. Nevertheless, I did like the meatiness of the pork strips. Our next dish was the Tea Smoked Duck. 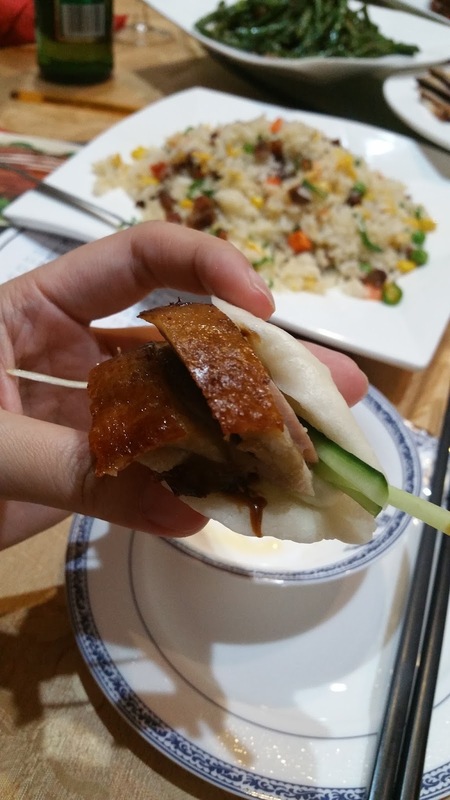 I immediately drew parallels to the more famous and widely known Peking Duck with two noticeable variations. 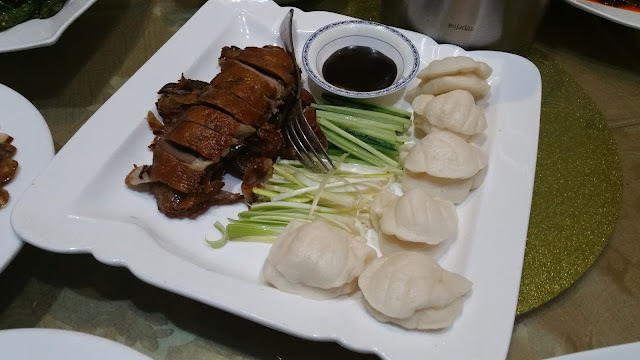 Firstly the duck was braised rather than roasted, which resulted in the meat being well infused with tea flavours, but also evidently lacking in crispy skin. It tasted like a much healthier variation though. 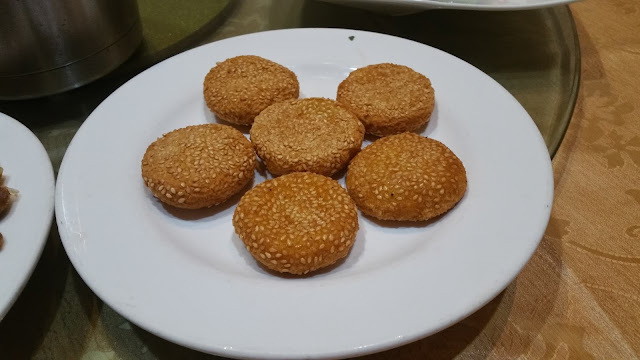 The second difference was the little buns we were given on the side, rather than the usual steamed pancakes. When put together, it resulted in a miniature bao with its hoisin sauce, cucumber and shallots. 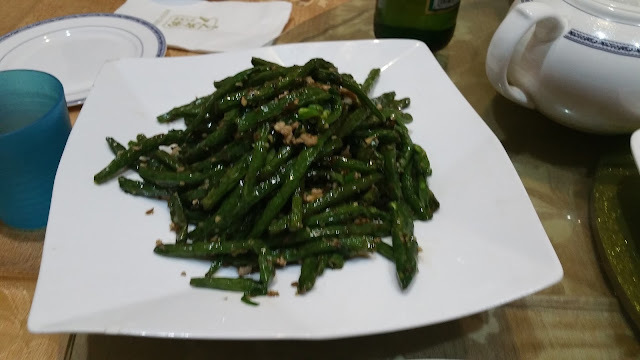 Our vege dish of the day was the Stir fried green beans with mince. It was also very mildly spicy. The dish was a little more oily than I had expected, with the beans well coated and tasted like it was almost slightly deep fried. It also leaned toward the salty side, especially the pork mince, but was otherwise really well received. 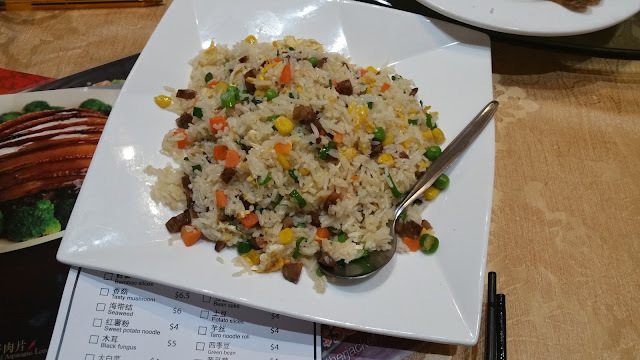 Our carbs for the meal included the Fried rice with Sichuan Sausage. The fried rice was done really well, each grain of rice was easily discernible and didn't stick together. Toppings included green onion, carrot, corn and sichuan sausage. Other than the sausage, it was the same as a regular fried rice, but I did appreciate the added smokey flavour of the cured sausage which added novelty and depth to the dish. 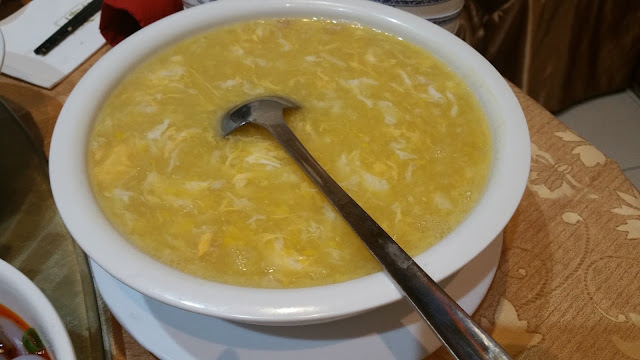 It wouldn't be a traditional Chinese meal without some soup, but rather than the hot and spicy soup, we settled for the Sweet Corn Soup to cool our palate down. The sweet corn was indeed very sweet, slightly more than it was savoury. I really enjoyed the egg mixed in with the soup which was of a very smooth, light and creamy texture. On the sweet end of things, we had the pumpkin pastry, which was made with organic pumpkin. The fresh pumpkin taste was evident throughout the pastry, which also had a fragrant sesame scent to it. The texture was akin to mochi, which meant it was quite chewy and elastic to taste, rather than my expected powdery texture of pumpkin. I found it quite enjoyable. 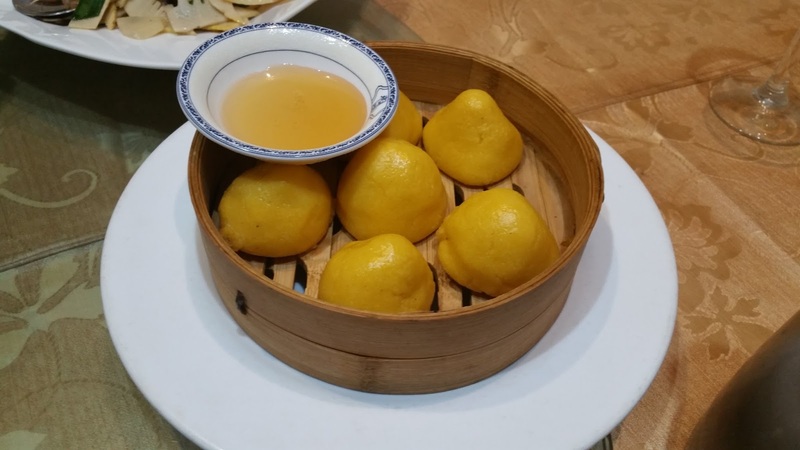 The last dish we tried was the steamed sweet corn bread, also known as wowotou, a hollow bread like dish served with honey to dip it into. Being made of corn, the texture was a bit more coarse than a regular bun, but had a strong corn taste to it. It was definitely a novel and interesting dessert which was very well received. A big thank you is owed to the manager who was a great host for the evening and for Tomcat who organised this meetup. Espresso & Matcha were invited guests of Fortune Well, but as always our opinions are soley our own.